When Mikhail Gorbachev introduced the policy of Glasnost across all Soviet government institutions in the late 1980s, it marked the beginning of the end for the Soviet Empire. What the policy meant that for the first time, the press would be able to disseminate uncensored information without fear of reprisal. The details of Stalin’s purges could be published for the first time; the previously hidden detail of endemic social problems could be printed in newspapers; and debates could be had and ideas shared with the Western world – legally. Gorbachev had pulled back the Iron Curtain and, if only momentarily, the Soviet Empire got its first authorised glimpse of democracy. But 19 years have passed since the end of Gorbachev’s short tenure as President of the Soviet Union, and unfortunately the spirit of Glasnost does not live on. Today it is estimated that nearly 80 per cent of those living in the former Soviet Union still live under authoritarian regimes that deprive them of fundamental political rights and civil liberties. Tightly controlled news media, pliant courts and brutal security forces are prevalent characteristics. The last ten years in particular, according to an extensive survey by Freedom House, have constituted “a decade of democratic regression in the former Soviet Union”. Nowhere is this more apparent than within the borders of Kazakhstan – where dissenters, journalists and human rights activists have been frequently and consistently repressed with zeal. Nursultan Nazarbayev, Kazakhstan’s 70-year old president, is one of only two leaders in the former USSR who also held power during the days of communist rule. Nazarbayev presents himself as a man of democracy, often asserting his commitment to the “protection and promotion of human rights and fundamental freedoms”. In reality, however, he is a dictator committed more so than anything else to the protection and maintenance of his own power. 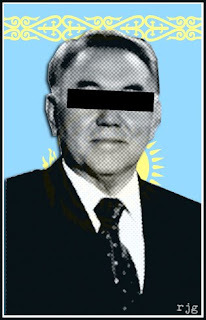 Glasnost, therefore, is far from the agenda in Kazakhstan. According to Human Rights Watch, independent journalists who criticize Nazarbayev’s government policies and practices face threats and harassment, prohibitive penalties for civil defamation and “antiquated” criminal penalties for libel. This year alone at least two independent newspapers have been shut under Kazakh government pressure, while examples of press repression are reported almost weekly by Almaty-based media monitoring group Adil Soz, reflecting the country’s position as 162 out of 178 in Reporters Without Borders’ Press Freedom Index. One newspaper in particular, Respublika, has faced repeated and well-documented harassment from the Kazakh government. In 2002, after having supported an oppositional political party (Democratic Choice of Kazakhstan), reporters from Respublika turned up to work to find the corpse of a decapitated dog outside their offices. Next to the dog was a note that read, simply, “This is the last warning”. The following day, their offices were burned down. But Republika refused to be intimidated and continued to publish, often under a different name in order to evade the authorities. Banned from the printing presses, and faced with a $400,000 fine in 2009 for publishing an opinion piece critical of the government owned bank BTA, the paper is now self-published by dedicated staff using office equipment, maintaining a circulation of 19,000. They have also adopted social media such as Facebook and Twitter to get their stories out. But their website, which once reached approximately 33,000 people per week (a substantial figure given that approximately only 34.3% of Kazakhstanis have access to the internet), has been blocked internally by the government. It was felt by some, though, that giving Kazakhstan the opportunity to chair the OSCE would force the government to push through reforms. This was undoubtedly based upon a willingness to give the country’s leadership the benefit of the doubt. After all, when Kazakhstan made its initial bid for the chairmanship in 2007, then Foreign Minister Marat Tazhin had pledged at the OSCE Ministerial Council in Madrid that Kazakhstan would bring its media laws up to international standards. “We are going to incorporate various proposals into a consolidated bill to amend the Media Law,” he said at the time. Yet three years on, the pledge rings hollow. Part of the problem, Plakhina believes, is Kazakhstan’s geographical location. The country is a corridor to Afghanistan and a key ally of coalition forces in the War on Terror. It is also home to the Caspian Sea, which contains oil estimated to be worth in the region of $12 trillion. Later this week, Kazakhstan will end its one year term as chair of the OSCE by hosting the annual OSCE summit, on December 1 and 2. International security is set to form the dominant part of the programme, but human rights and media freedom issues will also feature. Human Rights Watch will present a statement at the summit that will “urge the OSCE to prevail on participating states to uphold their commitments to freedom of expression across the board,” and the British delegation – led by Deputy Prime Minister Nick Clegg – will also raise human rights concerns. This will offer little reassurance for Plakhina and her colleagues at Respublika, though. For them there remains a sense of anxiety about what will happen when Kazakhstan steps back from the international scrutiny inevitably attached to the chairmanship of the OSCE. The newspaper, for instance, recently received an anonymous email informing them that after the summit they would be closed down once and for all.